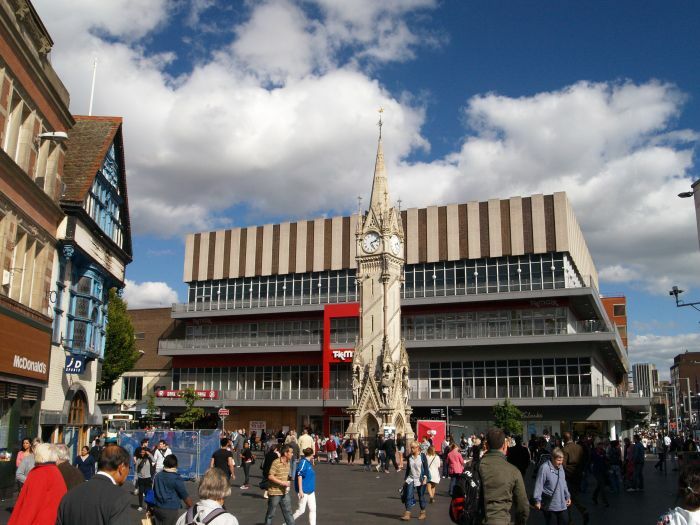 The iconic Clock Tower in the centre of Leicester, a popular meeting place and the intersection of five streets. 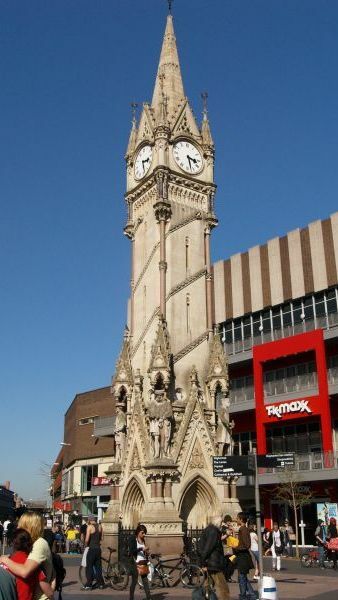 The stone Clock Tower has many carvings on it in a mixture of medieval styles. 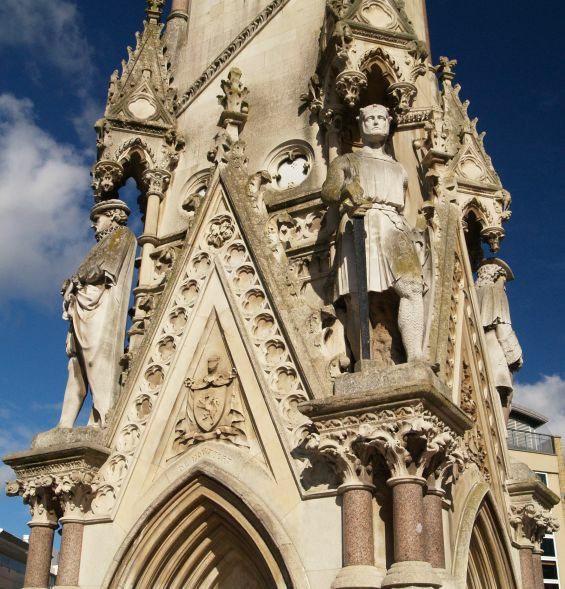 Simon de Montfort on the Victorian Clock Tower. 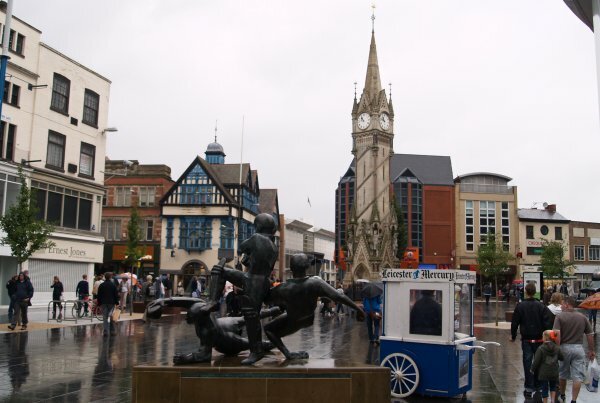 The Clock Tower and the 'sporting' sculpture' in the centre of Leicester. 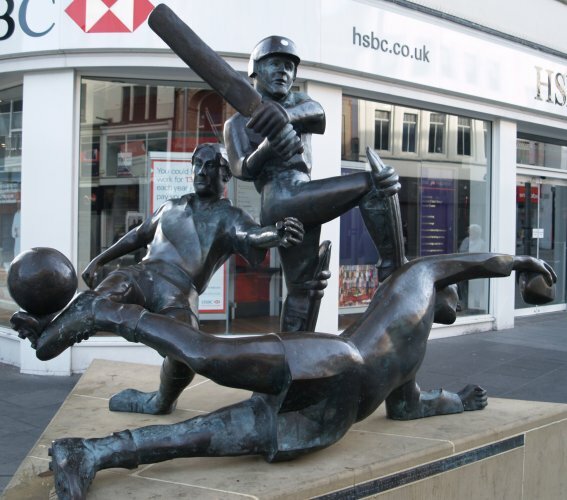 A sporting sculpture themed on football, rugby and cricket near the Victorian Clock Tower of 1868 in the centre of Leicester. 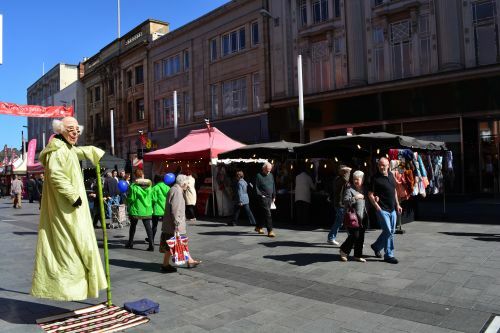 Most shoppers passing by don't seem to notice it! 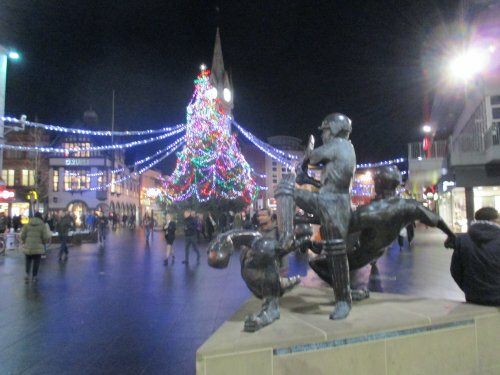 The principal 'local' teams are Leicester City Football Club, Leicester County Cricket Club and Leicester Tigers Rugby Union Club. 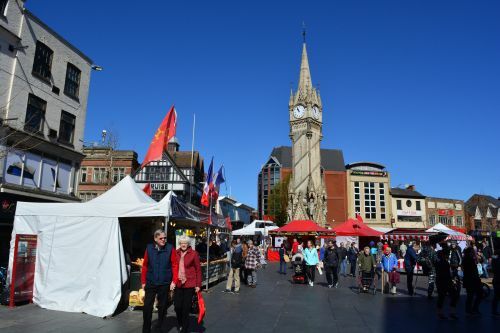 The shops and market near the Haymarket memorial Clock Tower. 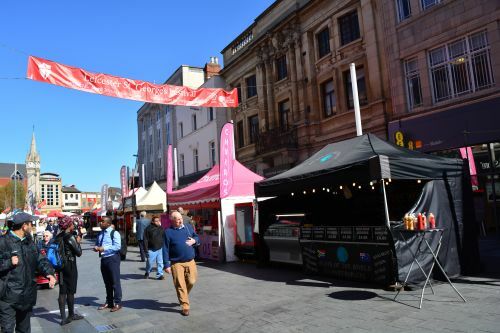 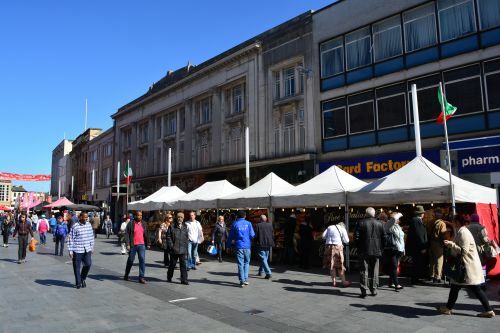 The many market stalls on Gallowtree Gate selling a variety of food from all over the world and a banner advertising the Leicester St George's Festival on Saturday April 23rd 2016. 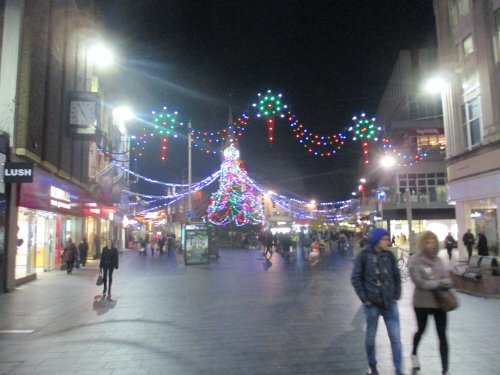 The Clock Tower area lit up with Christmas Lights! 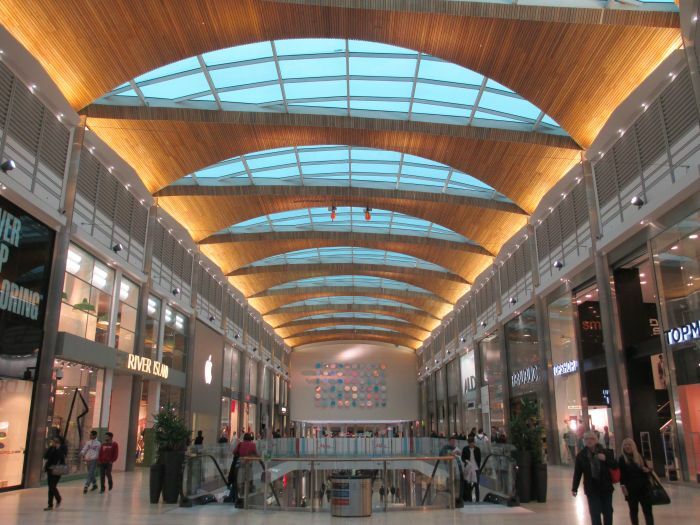 Just up from the Clock Tower is the High Cross shopping centre with classic high street shops like River Island. 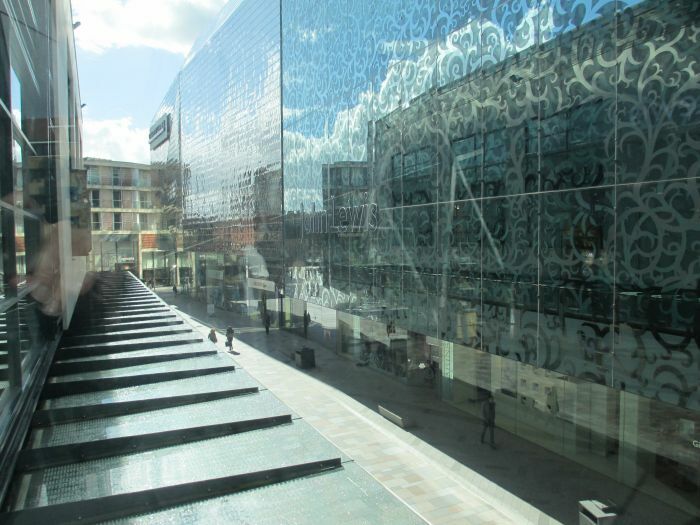 The external wall of Highcross shops on the left, the artistically interesting external wall of the John Lewis store on the right. 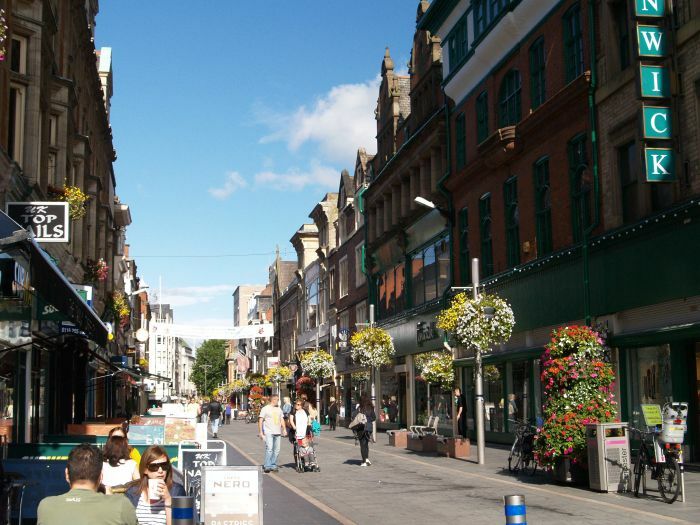 Market Street - flower baskets and cafe culture! 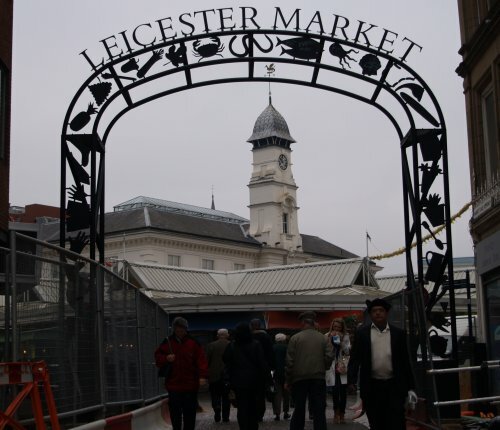 Just up from the Clock Tower and Sculpture is the entrance to the famous Leicester Market and alongside it is the Corn Exchange (in the background). 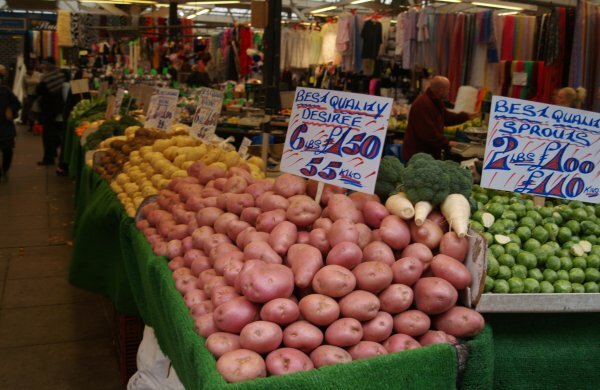 There are wonderful vegetables on display in the very colourful Leicester Market. 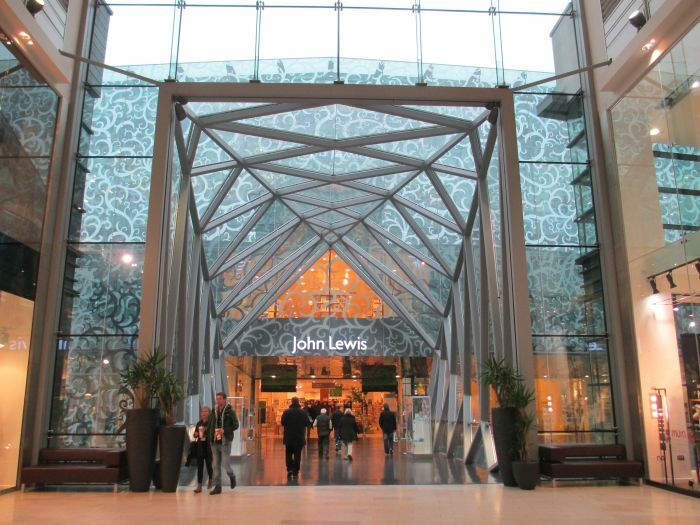 Despite the might shopping centre developments underway (2007) long live the market for good old fashioned consumers! 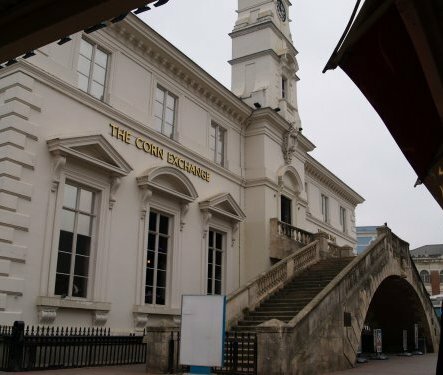 The Corn Exchange building a highly individual building architecturally, was the creation in 1850 of W. F. Ordish a gifted local architect who also designed the Clock Tower built in 1868. 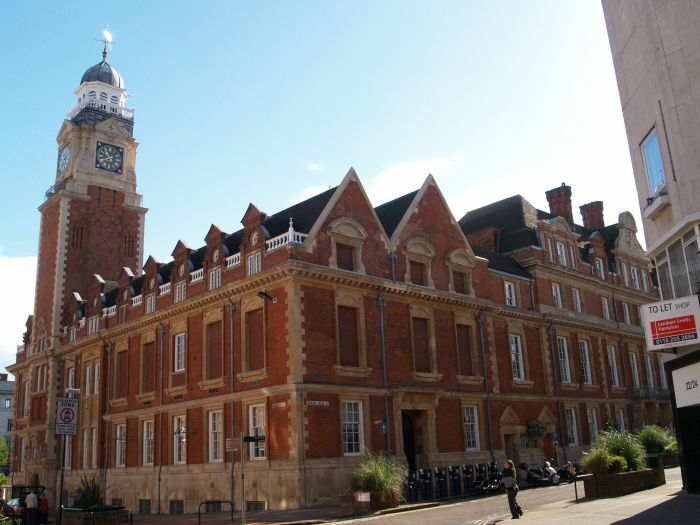 The handsome brick building of Leicester Town Hall with its tall angle tower, in Horsefair Street. 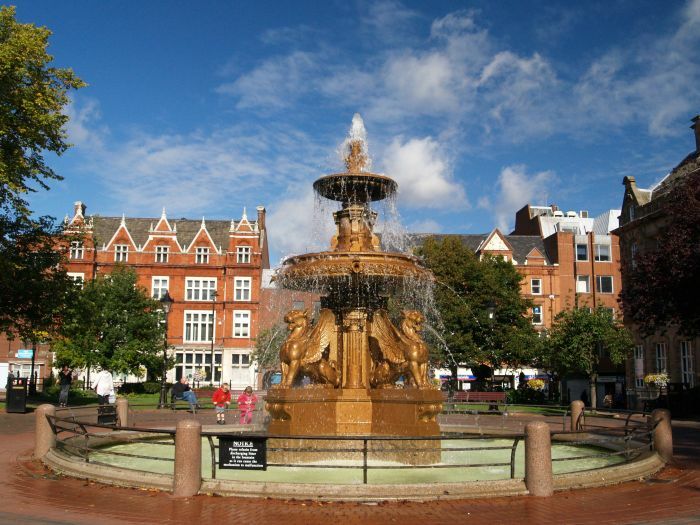 It dates from 1874-1876 by F. J. Hames of brick and stone dressings. 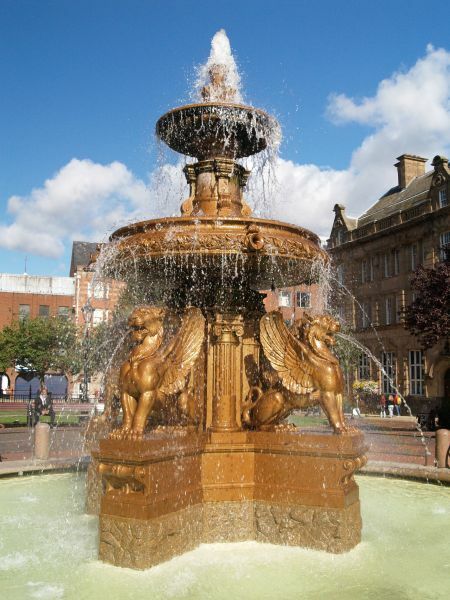 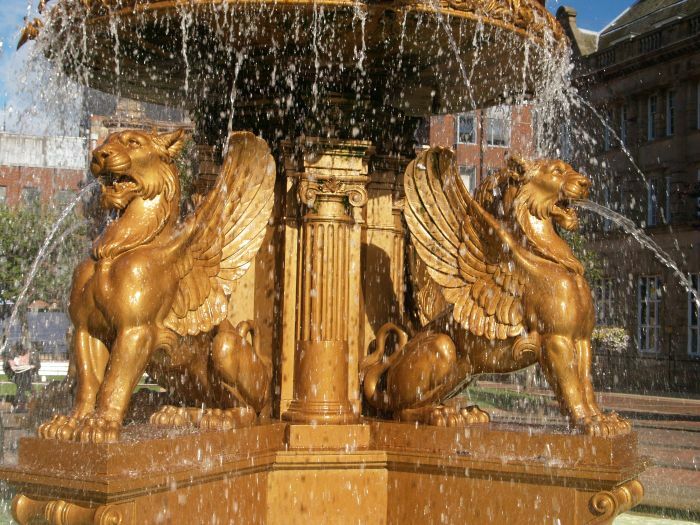 The four huge winged lions fountain in the square by the Town Hall, also by Hames 1879. 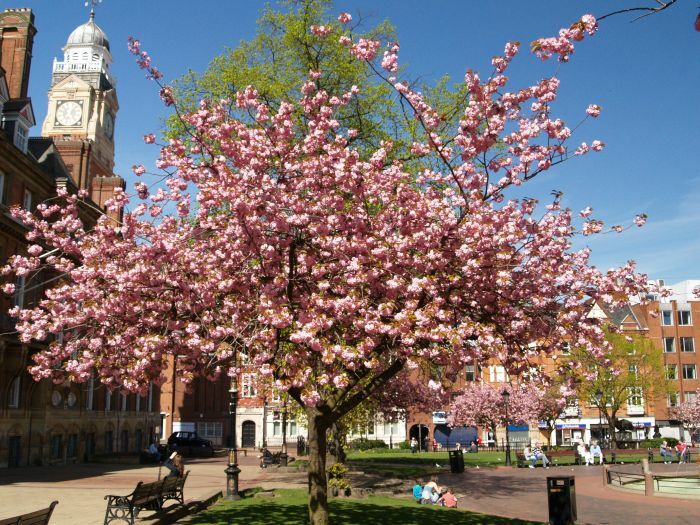 The Town Hall Square in spring - lovely pink cherry blossom in this popular relaxation spot. 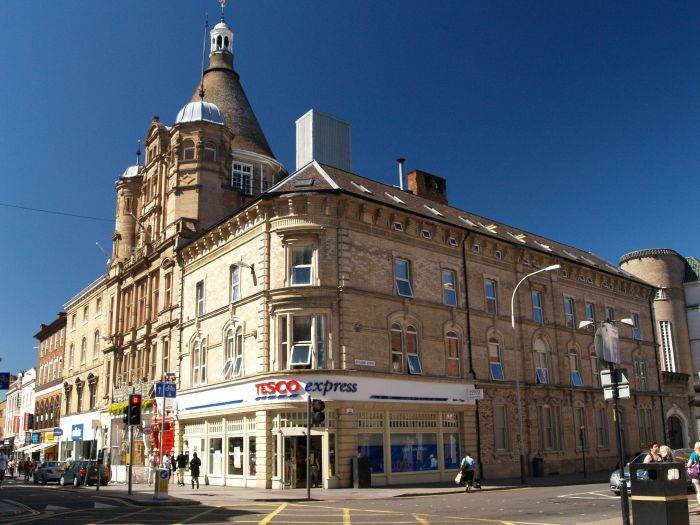 The fine buildings astride the junction of Granby Street and Rutland Street, the corner itself is now the store Tesco Express! 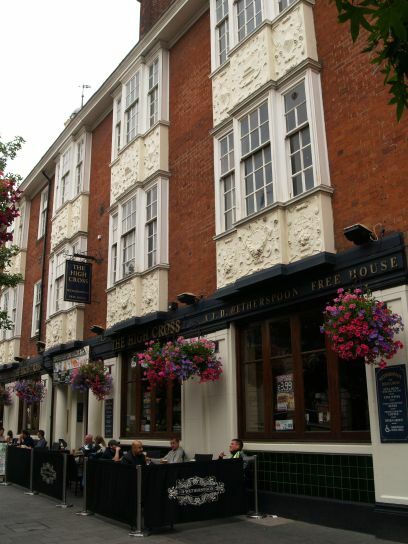 High Street, Leicester: Some of the fine buildings in the centre of Leicester have been converted into eating and drinking venues and this is well illustrated by High Street which runs down to the Clock Tower. 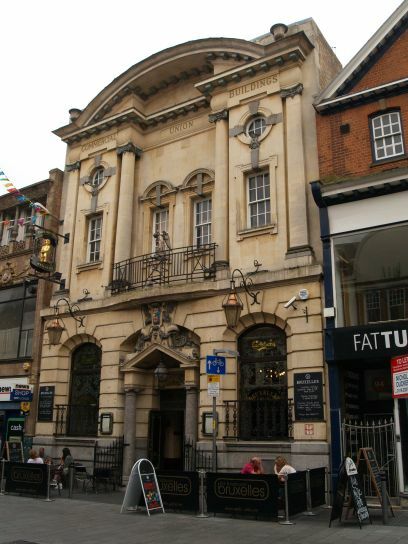 More buildings in High Street Leicester. 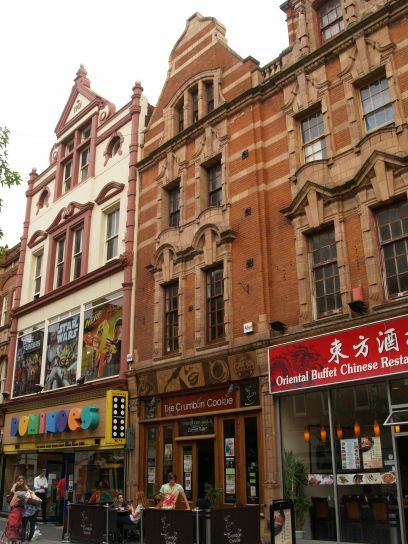 Left: The Crumblin Cookie cafe bar is sandwiched between Dominoes and the Oriental Buffet Chinese Restaurant, which are also fine buildings in their own right. 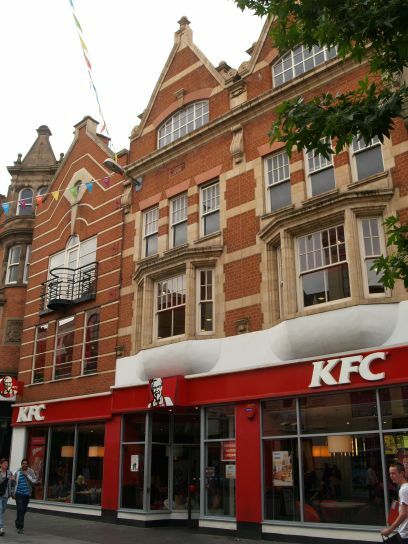 Right: The KFC fast food restaurant building was built in 1903. 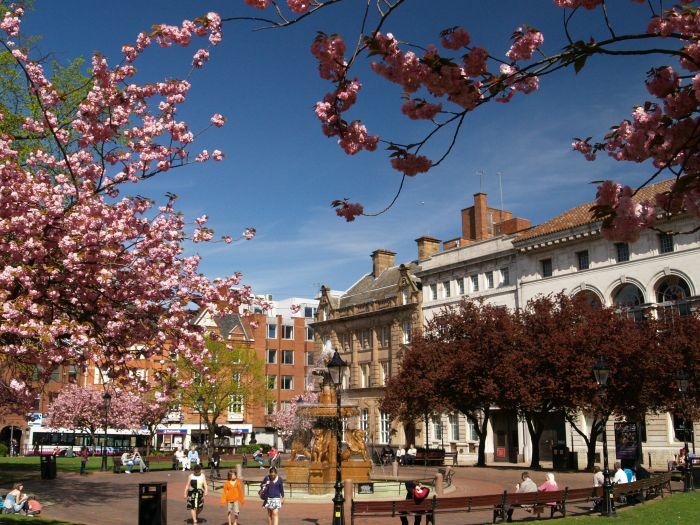 Enter place, town, village, walk, museum, mountain, anything of interest!